Despite the logo, this postcard has nothing to do with Travelocity. Congratulations! You will receive 2 round-trip airline tickets on Southwest, Jet Blue, United, or a comparable airline, plus a 3-day/2 night weekend getaway at a hotel such as Marriott, Hyatt and Hilton. Call within 48 hours. 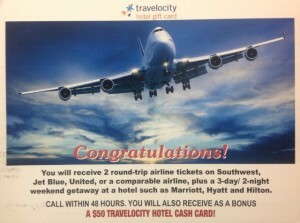 You will also receive as a bonus a $50 Travelocity Hotel Cash Card! All good stuff, but I needed to act quickly this time, according to the card. It said they had attempted to contact me several times and that this award must be claimed no later than 7 days after postmark. I must have missed their message on my answering machine and my caller ID failed to record the missed calls from Travelocity or the phone number provided, 1-888-263-6463. Luckily, I got the postcard in time! “Hot Diggity!” This offer was even better than the first one because twice they used words like “will,” which sounds like a guarantee to me! I’m thinking my next vacation is all but a done deal. Heck, I don’t even care if I have to sit through a 90-minute travel club presentation to claim my prize. I’m OK with that, especially since I have more time than money. I’m willing to sit through a short sales presentation in exchange for saving hundreds of dollars on plane tickets. Then I’m booking my seats on that “Freedom Bird” baby! And the tickets are FREE! F – R – E – E !…Right? …except not during the blackout dates or other restricted times and if those times are already full. applicable to Alaska or Hawaii. The only thing you “WILL” get for sure, is the runaround. ALL RIGHT! ENOUGH ALREADY! It’s time to stop kidding myself, trying to convince myself that this is a good deal for me. And you should stop trying to convince yourself, too. THIS IS A RIPOFF! You’re told that you must provide personal information, such as your age, marital status, or household income in order to be eligible for the prize or promotion. There’s a charge for anything you’ve won. More conditions or requirements arise as you move along in the process. You encounter hard-sell tactics pressuring you to join a costly travel club. Special deals, rates, or vacation packages are good for a limited time or one day only, creating a sense of urgency for you to quickly make a decision to purchase. The representative on the phone informs you there will be a “small service fee applied to your card” for accepting the prize or special offer. The old “ Bait & Switch” occurs, where you’re told about the “catch” after you’ve provided your credit card information, such as a requirement to buy an additional ticket or night’s stay at the regular (often inflated) price in order to get the freebie. You’re told you will have an opportunity to review the vacation package before your credit card is actually charged, when in fact, your card is charged immediately. The charges add up to more than the cost of the airfare and hotel had you purchased them on your own. For the discount travel package all you receive are coupons or discounts you could obtain elsewhere for free. Your vacation materials are slow to arrive in the mail, if they arrive at all. The promised materials do arrive in the mail but not until after the booking period has passed or possibly not until after the “review period” has elapsed. 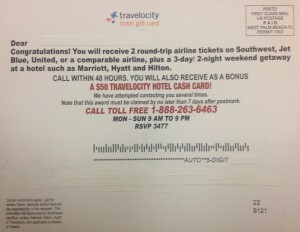 Directly contact the company whose name appears on any promotion (Travelocity in this case) to verify that they are, in fact, offering the promotion or prize. Don’t sign any agreements that don’t spell out all of the promised services and conditions for obtaining them. If you do provide a credit card, debit card, or bank account number, for ANY reason, expect to be charged. DO NOT provide the information until after all of your reservations are confirmed, in writing, with a reservation number. You can ask all the questions you want to about cancellation policies and the availability of trip insurance, but if you’re dealing with scammers, fraudsters, liars, or thieves, they’ll tell you EXACTLY what you want to hear, and they’ll take more of your money to do it. Victims of vacation scams don’t usually discover they’re being taken until they try to make their reservations, only to find out they cannot reach the “travel agency” because their phones are disconnected, the company has moved, or it’s out of business altogether. And of course, the travel company didn’t contact them to notify them of these “unfortunate circumstances” or to offer a refund. BOTTOM LINE: Be very wary of any vacation or travel “prize” or “award” – especially from a contest or promotion you didn’t enter or other unsolicited source. Don’t be like the facetious me above and ignore the warning signs just because you really want to be a “winner!” Shred those “Stay-Away-Cation” postcards and save your time and money, while avoiding the headaches. wet every day. Thankfully, despite the gloomy weather, my post-holiday season remains merry and bright. 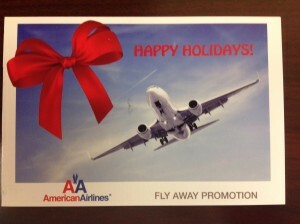 This is partly because I decided to stick around the almost Great White North rather than falling for the “American Airlines Fly Away Promotion” scam, which arrived in my snail mailbox during the holidays. 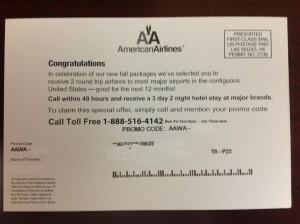 It said all I had to do was call the toll-free phone number and mention the promo code on the postcard. Wow! How exciting. I’ve never been to major brands, wherever that is. But there was fine print. At least they included fine print. Better to have a tip that’s hard to read than no tip at all. OK. That’s not a deal breaker, is it? Next stop, Google search. Articles and readers’ comments from Connecticut to Southern California quickly indicate the “promotions” range from gimmicks for getting people to sign up for expensive travel or vacation clubs, to paying for website subscriptions, to making a no obligation visit to the travel agency so they can show you how they can save you money. Ahh, these are the third parties. Oh yeah, and there’s often more fine print in the promotional materials. It informs you of what you actually receive — a certificate to claim your gift BUT charges for deposits, shipping and handling, processing, reservations, taxes, etc. are your responsibility. Not surprisingly, these charges can up to more than the value of the airfare and hotel accommodations. Any and all of these stipulations may apply. Worse yet, you may also need to sit through an informational seminar about the travel agency’s fantastic promotions, travel packages, or vacation club benefits. All applicable conditions often don’t become clear until it’s too late to change your mind, possibly after you’ve signed some sort of binding agreement. One more thing…anytime you’re asked to provide a credit card or bank account number to hold a reservation, for a deposit, or for verification purposes, BEWARE! That’s a red flag for an almost certain ripoff. Remember, any scammer can use a legitimate company’s logo illegally or without permission. And even if they use it legally, it may be nothing more than a marketing ploy dressed up as a free prize from a major air carrier. Are You Raising a Cyberbully? If you have a preadolescent, moody, hormonal kid, also known as a teenager, pre-teen, or “tween”, you should be aware of cyberbullying. In our digital, mobile, and social world, cyberbullying is a very real issue and a concern for parents. Cyberbullying is much more than just a modern version of the good-old-fashioned schoolyard bullying. In general, “cyberbullying” is the term used to describe online activities between minors that can range anywhere from text messages of a teasing nature, to digital harassment, and even threats of physical harm. 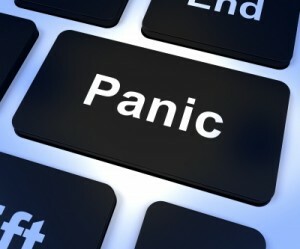 Usually it’s deliberate and repeated behavior with the intent of causing physical, psychological, or emotional harm to the victim by way of computers and cell phones. “Egads!” One more thing for parents to worry about! As if there aren’t already plenty of social minefields that parents need to help Junior traverse during his teenage-angst years, now it’s necessary to know how to recognize when he may be the victim of a digital bully? Indeed! And it’s precisely that picture parents typically associate with cyberbullying — protecting their little angel from the harm of online meanies. Most parents are working hard to raise a “good” kid, who’s kind and considerate of others. But all kids, even good ones, make mistakes and bad choices. They need our guidance. It’s important for parents to realize that a child is just as likely to be the cyberbully as they are to be the victim of one. Parents need to be aware of this possibility, even as heartbreaking and devastating as it could be to learn that your kid is the one behaving badly. Sometimes the child has no clue their actions could be classified as cyberbullying. Kids can also switch between roles, from victim to bully and back again, as part of a digital exchange. Whatever the case, parents need to address the issue head-on and not wait for it to just go away. 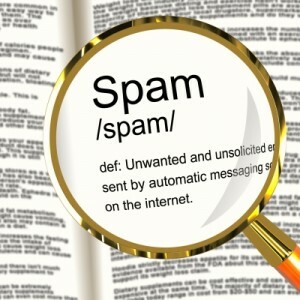 It’s anyone’s guess why your offspring might get caught up in the role of the cyberbully. Surely contributing factors are the ubiquitous and oh-so-easy-to-use digital toys of today, which make for an abundance of opportunity. Because communications are merely typed online and not face-to-face, kids can feel less encumbered, making them much more likely to write shocking or mean things they wouldn’t ordinarily say in person. The writer feels a sense of detachment and anonymity, making the comments seem not so personal. Attention – Looking for laughs , trying to be funny or look “cool.” Attempting to elicit some sort of reaction from the intended target or onlookers. Power-Hungry – Harassing others is a cheap and easy way for a kid to boost their ego. Mob Mentality – It’s easy to pile on or be a “me too” when you can get lost in the crowd. It’s safer, especially if a kid knows the behavior is questionable in first place. Mean Girls – It’s a way for kids to establish or improve their social standing in a group or clique. Reinforces the cyberbully’s place in social circles. Entertainment – It could be as simple as boredom. Too much time on their hands, not enough to do, and too many tech toys available to them. Revenge, Frustration, or Anger – It can start as “vigilante justice” defending themselves from bullies or standing up for others. Vicarious Tough Guy – It’s an easy way to be the tough guy or gal. Accident – Let’s face it, a kid could mistakenly send a message to the wrong recipient or not think something through before they sent it. So what are the signs that a child might be doing the cyberbullying? Uses several online accounts or ones that are not their own. Avoids talking about their online activities or what they’re doing on the computer. Quickly switches screens, minimizes windows, or closes programs when someone approaches or walks by. Appears to always want to hide their cell phone or computer from you. Uses the computer excessively or late at night. Becomes angry, upset, or irritated when they’re denied use of a computer, cell phone, or mobile device. Displays increased levels of aggression. Is unwilling to accept responsibility for their behavior. Laughs excessively while using the computer or other electronic devices. Talk to your kids about the power of words and how damaging and hurtful they can truly be. Talk to your child firmly about his or her actions and explain the negative impact it has on others. Force your child to really reflect on what they did, why they did it, giving serious thought to what the actual impact was on their victim. Try to find out if they themselves have ever been bullied. Require your child to do research on cyberbullying and the long-term damage and trauma it can cause people. 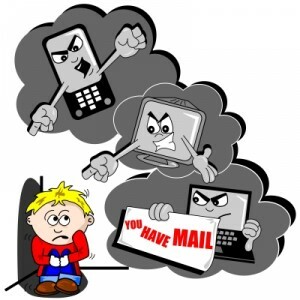 Consider restricting your child’s cell phone and Internet privileges until behavior improves and then monitor their activities closely. Remind your child that the use of cell phones and computers is a privilege. Consulting with your child’s teachers, guidance counselors, and other school officials could help you understand why your kid would bully another. If your child has trouble managing anger, talk to a therapist about helping them handle strong feelings in a constructive manner. Also consider seeking professional counseling to help your child combat the urge to harm or harass others. The time to address cyberbullying with your kids is before it occurs. Talk to them about what cyberbullying actually is and what forms it can take. Give examples and explain to them that joking around and teasing might seem like good clean fun, but it can hurt people’s feelings and lead to serious consequences. Also, don’t rely on the school system to educate or intervene when it comes to cyberbullying. There is limited guidance available about whether schools should intervene, or whether they legally can, in bullying situations that occur off-campus, outside of school hours, and/or that involve digital or electronic communications. Further complicating matters, cyberbullying occurs most often on weekends, when kids have more time and opportunity to be online. Bullying in any form is unacceptable. It can have severe and long-lasting consequences. When one kid bullies another, it can be devastating. When dozens of kids bully another, the emotional damage can last a lifetime. The more involved you are as a parent, the greater your ability will be to recognize cyberbullying and put a stop to it. Tech-savvy parents can model good online behavior and help their kids understand the benefits and the dangers of life online in the digital world.